This is a full view of a project I was working on earlier in the year as I worked with the Indian edging stitch. There are a few other stitches involved but they are incidental. My schedule is hitting a few bumps in the road as I am taking on some new work, reading several books and trying to manage a few other irons in the fire. No, not new needlework but the type of work necessary for paying bills. I am still trying to take out at least a little time to relax and stitch each day. I appreciate your comments and thank you very much for them. At the moment I’m just very limited for time in responding. If I’ve not gotten back to you or sent out a thank you yet, please bear with me. I will be back to a much more normal schedule as soon as I learn all this new work. I’ve been side tracked today. The new-to-me book that arrived in the mail was The Constance Howard Book of Stitches. And one of the stitches that she covers is the sorbello. Many thanks to Kay Susan for your post on that book. It has been interesting to look at all the variations that were in that book and compare them to some I’ve been working on. Now, of course, I want to try a few of the variations in the book. Many of SharonB’s TSTC stitches are in there. I notice only a few that we didn’t tackle there. Tomorrow I will have to settle down and read the text. One of the reasons I started working with the Eskimo edging was its close appearance to the sorbello stitch. This is a sample of two variation on the Eskimo edging stitch. Here are some of my sorbello samples. Here are other sorbello stitch samples. Just before I get started with the Indian edging stitch I wanted to alert those who may be interested to a great post by Kay Susan at S’mockery. It is an article concerning Constance Howard and featuring two of her books. Kay Susan kindly undertook writing this and doing some helpful photographs in part because of my question in yesterday’s post about Constance Howard. Naturally, my question about her arose after reading the wonderful introduction to her work that SharonB had done earlier this week. I know that many may have seen Kay Susan’s post at her blog yesterday, but if not, may have also missed the update to my post yesterday because of the time differences. Many thanks to Kay Susan for doing that post. And while there, please do look at her own exciting needlework, if you are not already familiar with it. Now on to the Indian edging stitch that Anne Gailhbaud taught me. I though you might like to see Anne’s embroidery where I saw first saw this stitch in use. It runs along the lower edge of this piece. Isn’t it a cheerful border? No wonder I began to ask Anne more about it. Many thanks Anne, for sending this embroidery and teaching me. I may mean something different by that word the word “variation” than commonly defined. In one of the previous posts in the series, I used the word “distortion” to mean exaggeration of some part of the stitch. In this post I am using “variation” to mean a change to the stitch pattern itself. A variation might include leaving out none essential steps, putting a twist in the loop of a stitch or adding a new step and so forth. These are not something I’ve come to think of as distortion but variation. However, as in distortion, I may have used a change in normal placement of some part of the stitch. Just as a quick reference for what follows here is a formal Indian edging row. In one of samples from an earlier post, Pattern and Embellishment, I did add and extra stitch fly stitch to the steps of the Indian edging stitch to make this variation below. So to me this is distortion and variation combined. But yesterday and some days prior, I was thinking much more along the lines of minimization. In the sample below on the left, I was thinking about making a twist in the top stitch and eliminating step two and making step three do the work of both. Not too, attractive, but the idea caught my eye. The right stitch shows the second step in variation or perhaps modification is a better word. I’ll pick up what happened to the variation on the left a bit later. This second variation looked familiar to me and I thought I’ve gone too far in reducing the stitch to its essence. Indeed, later research showed that in simplifying the stitch I wandered over into another called tete de Boeuf or Bull’s head stitch. Rissa of Rissa’s Pieces Pretty Impressive Stuff documents the stitch in a diagram here. However, if you look at this version of that stitch from Classic Stitches there is a decided difference. As Rissa mentions she has seen various versions of this stitch. I went back to the stitch on the left in the tan sample and came up with this variation using the twist at the top and the curved bottom from the right sample. Then with detached chain stitches added into the stitch pattern, I was happier with this variation. I was feeling both excited and puzzled about these experiments. I kept right on stitching and playing. I started doing these mirror images of the tete de Boeuf stitch not knowing what it was called at the time, of course. But I began working them vertically instead of horizontally. And by this means, back right into another stitch with this variation below. This looked like a modified queen stitch also know as the rococo stitch. I tried a queen stitch using a detached chain stitch instead of a straight stitch to catch it. Here’s the sample with a couple of other variations on the theme. That’s not the end of my attempts to work with the Indian edging stitch. I went back to the beginning and tried some more variations. I hope to post at least two more of those within a few days. It might have been some early childhood Christmas season when I first learned about paper cutting. While I was still using blunt point scissors to cut out construction paper strips for decorating the tree with paper chains, I’d watch my mom cut out beautiful tissue paper snowflakes with the sharp tipped, “grown up” scissors. My childish mind would anxiously wait as if on tiptoe to see the feathery creations unfolded. Perhaps that is why a few weeks ago as I was going through bloglines I was especially delighted to see this post of Ati’s at Ati on the crazy road. I loved this beautiful tree because it took paper cutting from two to three dimensions. And she pointed me on to Margreet’s blog where I lost myself in posts like this one that goes a step or two beyond the displaced square exercises my design teacher set for me last year. And then she had other posts like this and this one. I’ve only quickly highlighted a few of the different styles of paper cutting Margreet does. If you’re not familiar with Ati’s and Margreet’s blogs already, I do hope you’ll take a look and see if you don’t enjoy seeing their work. They do many other beautiful things besides paper cutting or scherenschnitte, I should hasten to add. Thank you so much for your beautiful work ladies! This month I also had another expanded square “sighting” at the Dancing Crow, a blog that I’ve been following since some time this summer. The post for December 7th features a postcard based on an expanded square design. As you may know I’m delighted by expanded squares and it’s so nice to see them translated to fabric and stitching. I’ve only recently been able to take photographs of my expanded and displaced squares and edit them sufficiently to post. As this blog changes with the close of Sharon b‘s TSTC and the opening of her TIF challenge. I’m sure you may be seeing some of them pop up as design tools that I put to use in the months ahead. Since it’s hard to leave the post without a photo, I’m turning a sharp corner here and posting a mini sampler of an Indian edging stitch with a slight variation. Christmas is close at hand, I expect to do one more post to finish up the barred chain stitch. And I plan to start posting again the day after Christmas (west coast, USA) to wind up the TSTC year with the Spanish feather stitch. I wanted to do this last post on the Indian edging stitch that I learned from Anne Gailhbaud. The focus of this post is on pattern and embellishment. I know I can’t say everything I want to in reasonable amount of space but I want to attempt to say and illustrate what is most important to me. I enjoy taking one stitch and exploring it as thoroughly as I can. As I do that, I enjoy the challenge of not just doodling but putting those variations into a piece. Involvement in Sharon b TaST challenge has allowed me to do the doodling but has not permitted me the time to do the designing portion of stitch exploration. Working with the Indian Edging stitch has allowed me the privilege in a limited way to do both the stitch experimentation and the design work. Once I get some understand of the stitch and how it may be distorted. I’m ready to start using it in a pattern. This is work that I still consider part of doodling. Sometimes the design work will force me back to more distortions or patterns. But I always work to obtain some understanding of the pattern and rhythm of a particular stitch before I work on the design. I don’t mean this in a “right” vs. “wrong” way to do something as you learn about a stitch, but just by way of explaining my own thought process. The next three photographs are some of the smallest elements of pattern that go beyond the simple step, repeat, layer and mirror. An inner circle. And look at the outer shape. Perhaps it’s a diamond at an angle. An open space at the center and other spaces between the Indian edge stitches. That’s where embellishments or other stitches may be used to create a larger pattern. A straight edged diamond on the outside; a square on the inside (Great for either negative space or for embellishment.). Overall a stable shape for larger patterns. An extra fly stitch at the end of the elongated Indian edging stitch to create this simple narrow repeating pattern. Elongated and curved bottom Indian edging stitches mirrored. Embellished with beads. Perhaps the most complex pattern in the post with some simple embellishment. There are six Indian edging stitches in this pattern with some straight and back stitches. In a design this pattern will easily make a line vertically or horizontally. And if vertically, a decision to mirror or repeat will make a big difference in this pattern. The last photograph unfortunately isn’t a great shot, but it is the largest pattern worked out in what I’m posting today. First, the small pattern it is made from. The larger pattern is made up by adding a cross stitch at each corner of the square, stepping the pattern. Then filling the resulting negative space with stitches looped through the cross and Indian edging stitches. I added a bead in the center of the loops both for texture and color. There is still so much more to be done with this stitch beyond distortion, pattern and embellishment. But I’m going to let this series of posts end here for now. After the first of the year, I’d like to pick it up again for at least one more post on “off grid” work. 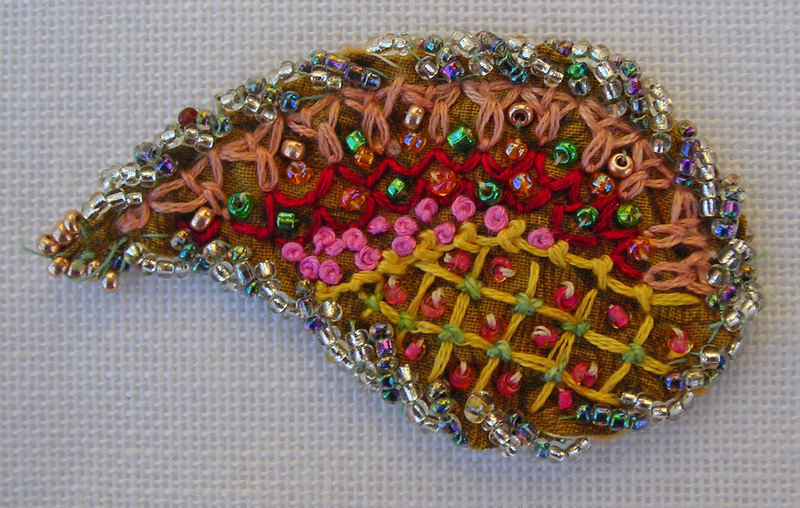 I wanted to let you see Anne Gailhbaud‘s work with the Indian edging stitch. As I mentioned in yesterday’s post, this is much better than looking at my samples because you can see the stitch at work in a particular piece. Please note that unlike some of my usual posts you may click these top two photos to see a detailed photo of the work. The first photo shows a broach Anne made. It is stitched on cloth and made very sturdy with the pin attached to the back. It is very beautiful and a small indication of what you will find in some of the necklaces that she does. The Indian edging stitch is at the top of the photo in peach thread just under the bead work that runs along the outer edge. Anne has been able to work with the Indian edging stitch very well in following curves. So this stitch is not just for straight edges alone. 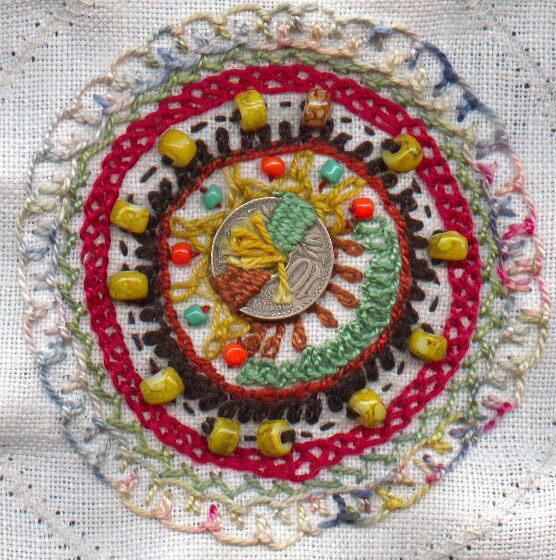 In the photo directly above the stitch is on the left and above the coin in the yellow thread. Anne does so many other kinds of work I wish I could show the great variety. These are perhaps decorations for the season. 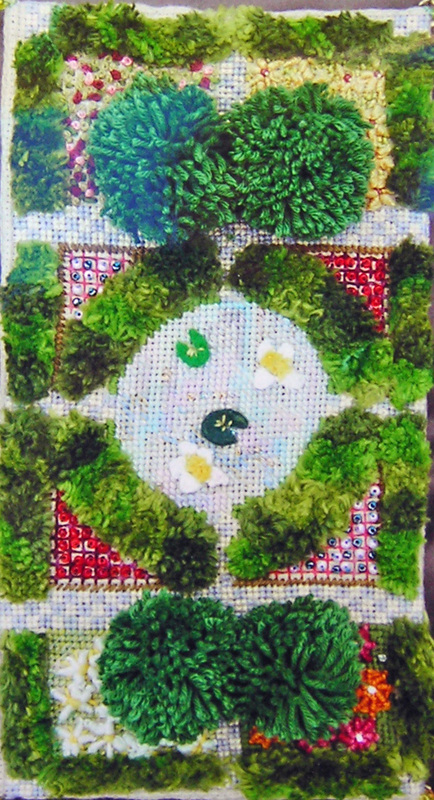 Here is her knotted garden. It is a three dimensional embroidery but not, I think, in the same style as stump work. Please excuse the quality of the photograph (click on photo to view details). The work itself is stunning but I have no scanner to capture the photograph more clearly. Anne has also perfected a way of embroidering on photographs. She does quilting and much more. If you haven’t visited her website, please do check on it to see more of her work. I also posted a few of her things in an earlier post last month. This is the follow up to the earlier post last week about the Indian Edging stitch that Anne Gailhbaud taught me. In SharonB‘s TSTC we have been encouraged to take a stitch and experiment with it. In Sharon’s words, “push it a little and see what possibilities it holds”. I first began to explore the stitch without any distortion. There are a number of things that are ideal to do with it. I made a line of stitches and then off-set and layered another line over it. I mirrored a line. All of that didn’t distort the stitch or push its structural limits. And, for me, that is an important process in learning about a stitch and seeing its patterns. I thought I might take the distortion process with the Indian edging stitch into this post and sort of talk aloud about what I think as I begin experimenting with a stitch. The Indian edging stitch seemed like an ideal stitch for this process because it has a number interesting areas that are easy to adjust. The way I learned the stitch, it was as many threads long as high. Just varying the proportions can make a big difference in the appearance of the stitch. And affect how it will work as an edging on a piece. The negative space is as important as the positive. …there are major things I could think of doing to that movement. I could make one end higher than the other. I could bring the needle up at some point other than the midpoint of its width. And does that have to be a straight line? I play the “what if…” game. I’m not sure if it’s because I like to daydream or because I like to investigate. Perhaps both. The photo above shows moving the mid point. The first move wasn’t extreme enough for me. I liked the second move better. It is one thread from the end right edge of the first stitch. Please don’t think you have to be working on a counted thread fabric to experiment. Once some of Sharon’s classes and example helped me move into some “off grid” work many of my experiments are on a non-counted fabric. I see a million more options the more I look at this. Sometimes I think I could write a book. But I promised myself not to make this post too long. I’ll try to say everything in photos more than words. Moving away from a straight line. The next photos show combining some of these thoughts together. Note that I’ve used a mirror image in most of these ideas. For me, it added symmetry, but it is not necessary at all. There are nice edgings made without going to a mirror image. What kind of edgings are now available from this one stitch? There are so many more possibilities. If you experiment with this stitch, please don’t hesitate to leave a comment and let me know. I’d love to see your work and I’m sure others would as well. Now I’ve gone back to the original stitch and applied only one of the distortions the length and direction of the last stitch. Thank you so much, Anne! In tomorrow’s post I will let you see some of Anne’s beautiful work where the Indian edging stitch is used in a piece rather than just in all these samples. And I will also be posting some other work she does. You are currently browsing the archives for the Indian edging stitch category.